I know the Rangers remain formidable, and the Angels have certainly upgraded, but I thought the Tigers chances of winning the pennant were the best of any American League team. 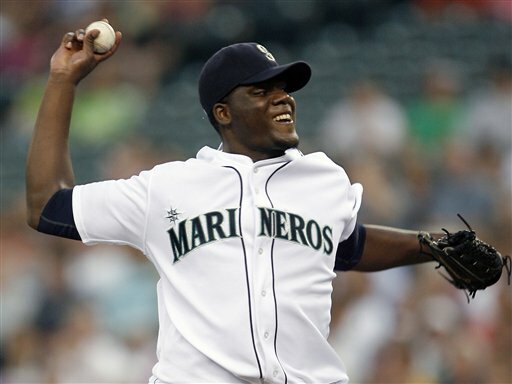 I'm not so sure anymore because the Yankees acquired Michael Pineda from Seattle. I know Pineda struggled the second half of last season, and the Yankees gave up excellent prospects in Jesus Montero and Hector Noesi in the deal, but Pineda's upside is extremely high. And he will likely make a big improvement this season. Coupled with signing of Hiroki Kuroda, it gives the Yankees a starting rotation that could be very strong. Pineda is capable of becoming baseball's next great pitcher. It gives added importance to the Tigers signing a capable fifth starter to begin the season, add bullpen depth and pull the right trigger on a major deal, if not during the remainder of the off-season, at some point before the trade deadline. As long as the glaring holes exist at 2nd and 3rd base, the Tigers will not win the pennant. Maybe the division but not the pennant. Pat, I think too the Tigers have fallen behind the Rangers and Yanks. I like what the Rangers and Yanks have done so far this off-season. I think the Tigers just have enough prospects to make one move and only enough payroll left to make one move. Should the Tigers do something before the season or wait to see what holes develop during the season and fix them before the tradeline? Tigers do have the luxury of being in the Central. So I wouldn't complain which path they took. The Tigers are like the Lions. One has Verlander and Cabrera, and the other has Stafford and Johnson. No matter how much you might want to spike the koolaid, neither one is going to be a champion any time soon. Falling behind the Yankees? Since when were they ever ahead of the Yankees? Better stadium in a better neighborhood, not afraid to spend money on high profile players. world-wide recognition, World Series championships, selling team apparel all over the country, things to do in NYC versus things to do in Detroit? You got to be kidding. those rotation additions increase their likelihood of making the postseason again, but don't increase their chances of success in the playoffs much. Burnett will likely be replaced by one of the new guys...he did well in his playoff start against the Tigers. The Yankees everyday lineup is aging. Injuries will become an increasing issue and their depth will be tested. Now if the Bombers' go out and sign Prince Fielder to DH, then the rest of the AL has a serious problem.